Okay, as I said in my last Nomad review of the chargers and cables, I said that they make a whole lot of awesome cases. Today, I’m going to be reviewing six of them for the iPhone 8, iPhone 7/7 Plus, iPhone X, and Samsung Galaxy 8. I believe that this has been referred to as the “Rugged Case”, but it is more like the Hex case. 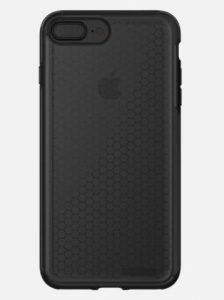 I am assuming it is called that due to its hexagonal shapes on the polycarbonate and TPU rubber construction. I like the hexagonal shapes because they really make the case stand out, and I am not certain why I like it so much. What is interesting is how it gives protection to the iPhone 7/7 Plus, and it will give protection for a 2 meter drop. It has all the proper holes and the raised edges to protect the iPhone screen. It comes in the Black and Smoked Gray, and you can find it on the Nomad site for $39.95. This particular case is one of those cases that allows it to close like a book. Not only that, it has the slots made for 3-6 credit cards, driver’s license, and whatever else that you have. By the way, there is a pocket for the cash too. I have reviewed cases like this before in the past. The issue that I have with these types of cases is that if you are using your phone, you have to flip the cards to the back. Then you are giving everyone a view of what credit cards that you own, and that flap thing becomes like a book that you break the spine on. There is a bonus that is uses vegetable tanned Horween leather, and then elegant construction for the Dow Dupont polycarbonate frame. You can get it on the Nomad site in rustic brown for $39.95. Okay, there is hardly any difference between the Folio of the Samsung Galaxy 8 (S8) and this particular Leather Folio for the iPhone X. 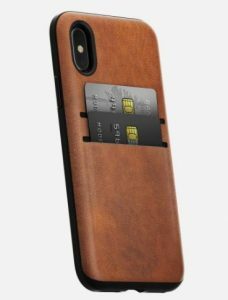 It has the spot for 3 credit cards as well as a cash pocket, but this is compatible with wireless charging, which is something that I didn’t mention last time when I reported on it in the last section. I have already stated what I liked about the leather folio, and it has that Horween leather look. By the way, it has a rich patina look after extended use. That means that it changes to a darker color of brown later. It actually looks pretty dark brown already. 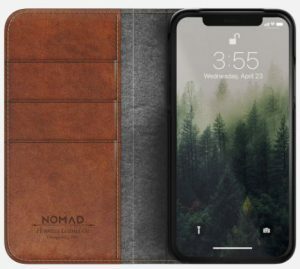 You should be able to purchase the Leather Folio for the iPhone X as $49.95 on the Nomad site. As you can see in this image, the Clear Case is kind of a hybrid or a Two-Face version of the leather and clear cases that Nomad puts out. The end result is the some new kind of aesthetic that I like a lot, and will be imitated. It has that vegetable tanned Horween leather with the Dow Dupon polycarbonate frame, and they are somehow fused together. It also blends together with raised edges to protect the iPhone screen, as well as giving the iPhone 7/7S/8 Plus protection for 6-foot drops. Oh, this is quite the awesome case, and if you have that version of Apple’s smartphone, this is great. You can purchase the Clear Case for the iPhone 7/7S/8 Plus for about $39.95 on the Nomad site. 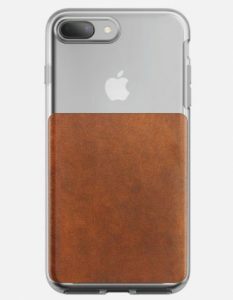 Okay, now it is time to talk about another mixture between vegetable tanned Horween leather and Dow Dupont polycarbonate frame with iPhone X. There seems to be a lot of this on these Nomad cases, and honestly, that is kind of refreshing, really. Yes, I would love to talk about its features, but I have talked about them already with the other cases. It has 3 credit slots, and there is also a cash pocket. I guess people are using their cases for wallets now, which means that the wallet market is about to be phased out. 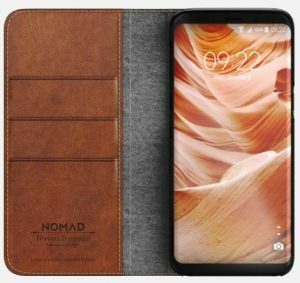 Now, if you want to purchase this particular case, you should be able to purchase the Clear Folio for the iPhone X on the Nomad site for $49.95. So, here’s this last case that is made of vegetable tanned Horween leather, not like there is anything new about this. I suppose there are also great features like 6 foot drop proection as well as the ability to hold 2-4 credit cards. Oh yeah, it develops that rugged patina look after a while. So yes, nothing new here, but I suppose that the takeaway from this is that you should always bet on Nomad. I mean, they make a lot of great cases, as well as chargers. Yeah, there’s no way I’m going to say anything bad about Nomad. 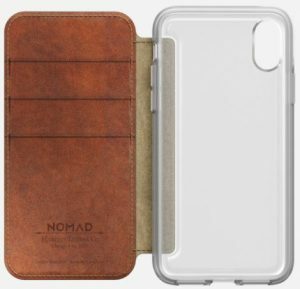 You can purchase the Nomad Wallet Case for the iPhone X on the Nomad site for $39.95.